The South Face of Talbot marks the right hand edge of Macpherson Cirque. Don’t underestimate the effects of foreshortening, these are long routes taking most of the day and some of the night. 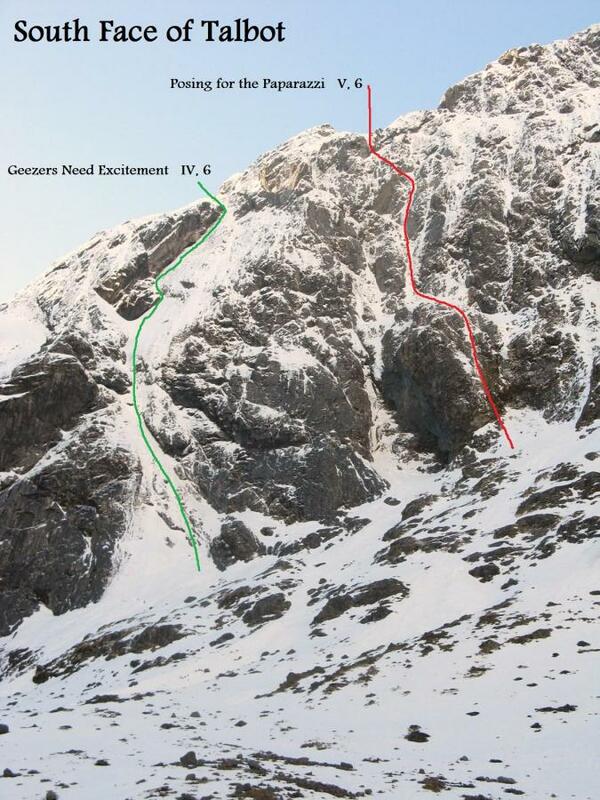 Descend via Talbot’s Ladder, a relatively ‘avalanche safe’ descent, which is far longer than it looks. The slopes above this face are among the most unpredictable in the area. Bear this in mind when considering a route on this cliff. Also bear in mind that the routes finish some distance below the top of Talbot. Don't fall into the trap of thinking that it's all over just because there's no more technical climbing. This line takes the large, right leaning, man eating corner high on the left side of the face. Originally climbed in lean conditions, technical difficulty may ease with more ice, however, more snow may increase objective danger. Gain the foot of the corner via a prominent left slanting gully, on easy snow with the occasional harder step, for about 250m, to a cave below a large roof. From here four hard sustained pitches are followed to easier ground, leading to the upper snowfield. Gain the right hand side of the roof via an ice smear from the snow gully below. If the smear is not present a direct traverse may be possible. Climb a short overhanging turfy wall, then traverse left on flakes back into the main gully. Above this, three pitches climb the corner system, each with difficult sections traversing out right underneath the large roofs. On the left side of face. Climb up to the top of the snowfield immediately right of a large gully. The route starts up the buttress which is the other side of the large gulley. The first couple of pitches follow a very thin runnel of ice, moving from right to left. The climbing is difficult mixed climbing, putting to good affect the joys of frozen turf. The slopes above Posing for the Paparazzi regularly avalanche and an easterly weather pattern may make it more dangerous than usual. Allan Uren, Dave Vass, 2000. Start in the cirque directly opposite Homer Saddle and take a direct line to the summit. Climb up the fan and follow steep rock with an ascending traverse to the right, up snowgrass slopes to some brittle rock, then up a large rock corner and continue up parallel to the usual exit cracks behind the notch to the summit. Austin Brookes, Colin Dainty, Ken Hamilton, Ralph Miller, Oct 1965. The triangular face below the Notch Route, going right through to the summit. Starting at the toe of the buttress around to the left from the Notch Route. Joining the ridge above the notch by climbing narrow ice runnels. Allan Uren (solo), July 1992. From the top of the shingle fan behind Homer Hut the route zigzags out left to reach the ridge at the higher of two prominent notches, then up a crack around the corner to reach the upper South Ridge. Bill Gordon, Gerry Hall-Jones, 1954. Up the Notch Route until it tends left, go up a crack in the wall (A1, but can be free-climbed by traversing left) climb right for two rope lengths, then up and right to the large cleft to the South East Ridge. John Fantini, Murray Jones, Jan 1970. Starting up the large snow slope behind Homer Hut. Trend up and right toward the ridge. Geoff Gabites, Kevin Rogan, 1973. A feature on the right side of the face. From the highest point on the slabby lower wall, climb up through a series of grooves to a steep wall at three quarter hight, crux. Graeme Dingle, Noel Sissons, 1972.